chatocamacho wrote: Which one would you prefer to use? Chinese Wash is great as a two way deal, because you are cleaning something and making it "lucky." The Buffalo Ammonia is a powerful cleaner and jinx buster. I actually would use them both with the Buffalo Ammonia first, followed by the Chinese Wash. If a place just feels a bit "funky," I would use Chinese Wash. If I had a very horrid experience in a place, I would use Buffalo Ammonia followed by Chinese Wash. Also Chinese Wash is great for bringing in business, so I would use that at a place of business. I decided to use buffalo ammonia to cleanse my house and I just have a few questions. In the instructions it says to scrub the floors, since I have carpet all over my house, would I scrub the carpet? Could I also scrub ythe walls? Do I have to cleanse the whole house, or could I just do one room? Re: chinese wash or buffalo ammonia? That would depend on what I'm doing. 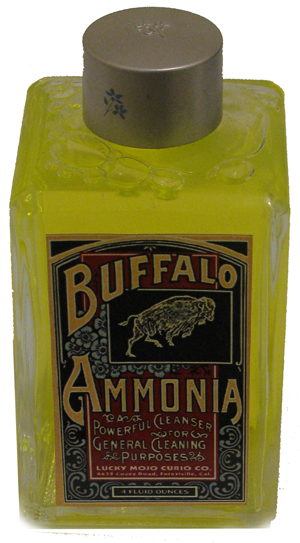 If I'm cleaning off new candles, Buffalo ammonia is the choice. If I'm doing a routine mopping of the floor to cleanse the space spiritually, then Chinese Wash is preferred. 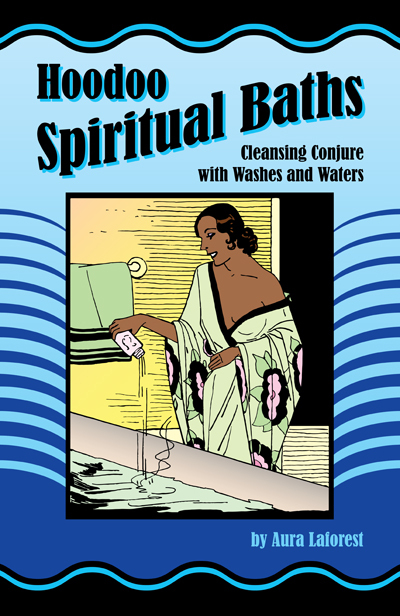 If I'm making a spiritual bath, well, probably neither (although some baths could include Buffalo Ammonia--I just prefer not to). What is your desired application for these cleansing products? chatocamacho wrote: I decided to use buffalo ammonia to cleanse my house and I just have a few questions. Cleanse the whole house. If you have carpents, just use a straw broom or sponge mop lightly on them. You don't have to drench the carpets down. Make sure you get rid of the broom or mop after you are done. So just don't use the whole bottle of Buffalo Ammonia in the bath. On the use of ammonia in Hoodoo, how do you respond to people who say that it is harmful to the environment? I understand that the use of ammonia in Hoodoo is traditional, but 100 years ago people were carrying around liquid mercury in nutmegs before they found out it was harmful and according to Cat's website bluestone was once used in mojo hands for gambling and protection before it was discovered that bluestone was toxic and unsafe to handle. In the new millennium when people are trying to go green and become more earth friendly, is it time to stop using ammonia as well? PS: I'm just asking this for the sake of discussion and am not judging anyone or looking to pick a fight. Household Ammonia is a highly dilute form of Ammonia. Additionally, the use of Ammonia in spiritually cleaning is measured in drops per bucket, diluting it further. No one is ingesting it. By the way, a dilute solution of Ammonia is one of the best ways to neutralize a jellyfish sting, if you ever get one. the text that I highlighted, about getting rid of the broom and mop after using it in this cleansing, is this true for any house cleansing? Like, if I were to use the Chinese Wash to clean out my home (which I am about to do) do I need to throw away the mop and broom when I am done? Or is this specific to the use of Buffalo Ammonia? I was always told that for a cleaning you get rid of the broom and mop far off from your property, regardless of exactly how you go about that cleaning, but thats just how i was taught. oh fudge! That sure puts a kink in my plans.... I need a mop I don't mind chucking out... but Thank you HailDiscordia, for the reply. I appreciate it. Does everyone here do this each time they use any of these washes? Maybe only doing it once or twice a year is best. Personally, if you were cleaning up a very specific and bad mess, then I would get a new mop/broom and then dispose of it afterwards. However for routine spiritual cleansing I don't toss the cleaning implements, I spray it down with florida water. That's just my opinion. Your mileage may vary. Even though I use 'green' cleaning products on a normal day....I use the 'cleansing' products the old fashioned way. A few drops of the buffalo ammonia along with the chinese wash is literally a breath of fresh air. I only throw out the old broom and mop once a year, after a major cleansing. Otherwise, I do the same as someone else said, cleaning them with Florida Water. I used Chinese Wash today. I washed my living room 2 times from back wall to door, but don't know if I made mistake using same mop with orange water also. Kinda cleansing one room at the time? Should i get rid of that mop immediatly and use a new one for orange water...? Most people don't get rid of their mops after a spiritual cleaning unless it's a really bad mess that you're dealing with (mops can get expensive after all! ); they simply cleanse it with a spray of Florida Water or a dilute spritz of Chinese Wash and hot water. Some have mops and swiffers just for spiritual cleansing and some use their usual mop and bucket. So in brief, you'll have to decide on your modus operandi depending on your comfort level and funds. The idea of discarding a mop or broom after cleaning is ridiculous to me. It is conspicuous consumption, a waste of resources, a financial drain, and a uselessly baroque "rule" that has been thoughtlessly added to or conflated with the much older rule to use a new broom when you move to a new house. Obviously, if the traditional statement is "buy a new broom when you move to a new home," this means that moving is special and normally you do NOT buy a new broom! Right On Miss Cat! My old mop, bucket and broom with their nicks and bumps from much use, sitting in their usual corner of the bathroom, thank you from the bottom of their dingy-chinese-wash-infused hearts. Thank you.Excellent information.I didn't get rid of that "old stuff", I sprayed it with Chinese Wash and I think it should be ok.I will continue cleaning my premises today.According to my knowledge, it should be good moon to get rid of old energies etc.